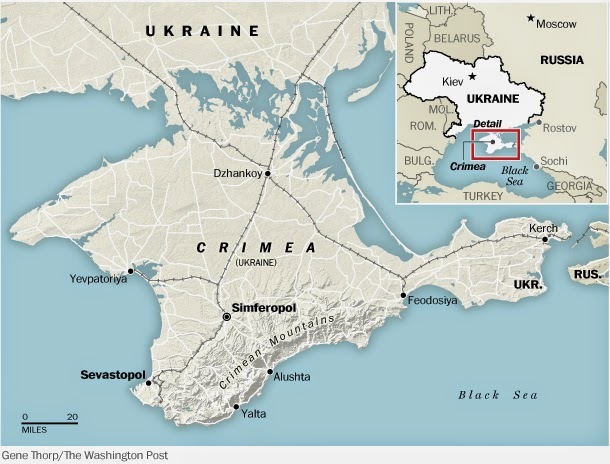 Unless you've been hiding under a rock the past few months then you have undoubtedly heard about a ruckus going down between Russia and Ukraine - especially surrounding the region of Crimea. This issue has had a large impact on the world but it has also affected me and my mission work here at the Mariners' Club. Crimea is a relatively small peninsula on the Black Sea that used to belong to Russia and has a population that mostly speaks Russian. Crimea, being a peninsula, also has a very large seafaring population. According to the International Chamber of Shipping, nearly 20 percent of seafarers come from Eastern Europe, and a large part of them in my experience are Ukrainian or Russian. 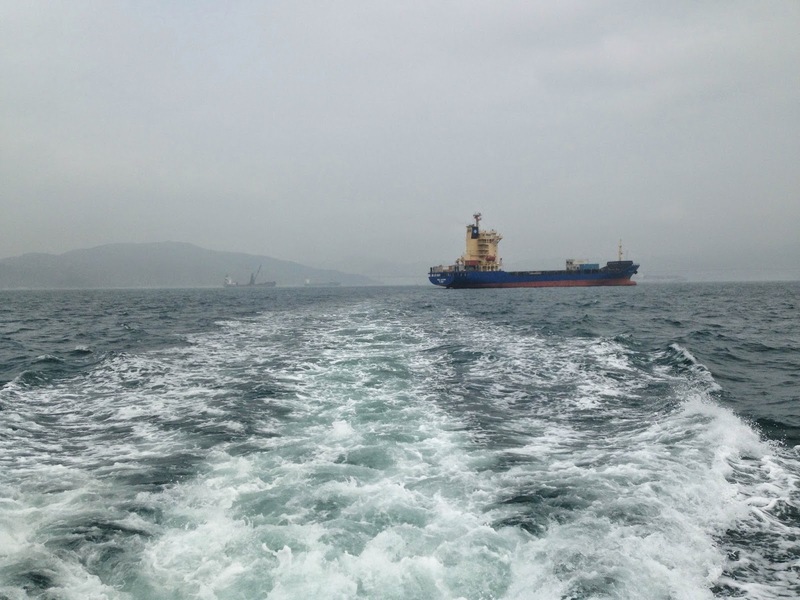 I meet a lot of Ukrainian and Russian seafarers out on the waters of Hong Kong. I'd say nearly every other ship I visit has a Ukrainian/Russian set of engineers or officers. It's been fascinating talking to seafarers from these countries as this international controversy has hit a fever pitch, and I have been able to receive real citizens' perspectives on what is happening - not just the perspective of the western media. Seinfeld aside, I can hardly imagine what it must be like to away from your home for months on end while your family, friends and countrymen weather a massive diplomatic crisis like the one occurring in Ukraine (one in which could cause the next big war). I know I would be so worried and stressed about what is going on. Is my family all right? Is my home safe? Sadly, such is the case for the many of the guys I meet on the ships out in the water. I met one such character on the Mell Satumu, a German-owned container ship, last week. Here is his story. Meet Vladimir, the electrical engineer of the Mell Satumu. A Crimean-born Ukrainian Russian who has been living at sea for months, and doesn't know what kind of home he will return to. Vladimir is the only electrician on the Satumu and is currently in the middle of a 10-month contract. Besides constantly reading on the news that his country is in political turmoil back home, he has also noticed a strange trend on his Facebook. 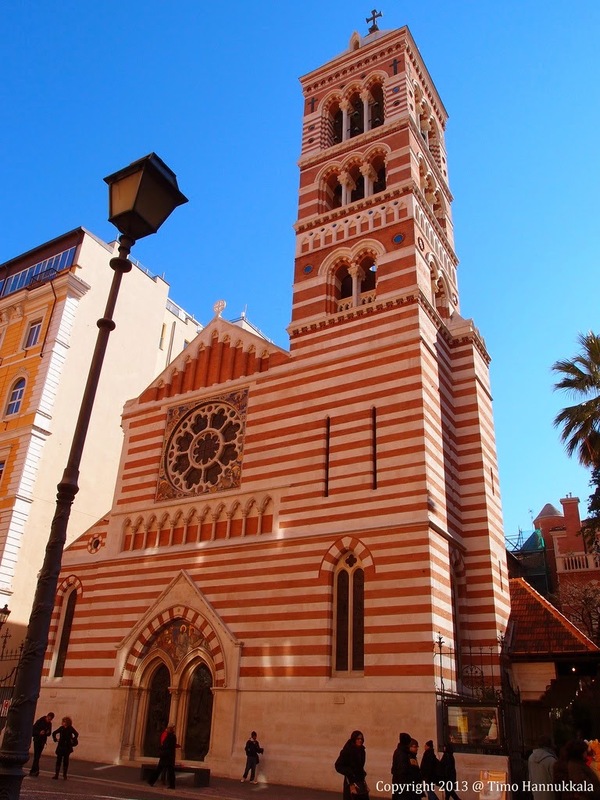 His Western Ukrainian friends will no longer talk to him, and in some cases he gets messages of hate sent to him. The reason? Only because he is from the Eastern Ukraine. "Friends no longer talk to me," he says. "And for what? I haven't done anything. I haven't had anything to do with what is going on. I've only be here on this ship! People Think I am responsible because I am pro-Russian." Yet, that is really the least of Vlad's worries. Vlad tells me that because of the recent declaration of Crimea as an occupied territory, he will not be able to renew his US Visa (something that is very necessary for seafarers on ships doing business in the United States). The only way he would be able to renew his US Visa would be to travel to the country's capital city, Kiev. However, Vladimir cannot go to Kiev as he would face arrest and persecution by the Eastern Ukrainian government (because he is a Crimean resident and speaks easily-recognizable Russian; not Ukrainian). In other words, Vladimir is out of a job. The Mell Satumu in all her glory. What is in store for Vladimir? What will be waiting for him in Crimea when he signs off the Mell Satumu in a few months? I hope that the issue with Ukraine and Russia is resolved quickly and peacefully so that people like Vladimir can get on with their lives. We can only wait and see though. I do ask that you keep him in your thoughts and prayers. While the outcome of the Russia/Ukraine issue is murky, one thing is for certain; we must always remember the humans that are being affected by these seismic events, and we must remember that that they are indeed humans - not Russians, not Ukrainians, not Communist, not Capitalist. Humans. Sitting and talking with Vladimir, I realized that we had been spoon-fed nationalistic news from our respective countries all of our lives. Of course I am an American (and a proud one), however I had failed to see how these people from Russia and Ukraine were just like me. They want to work for a living, they want to see the world, they want to provide for their families. They are not an enemy. The only difference between us is the country in which we were born - we are both human and we both want to be happy. 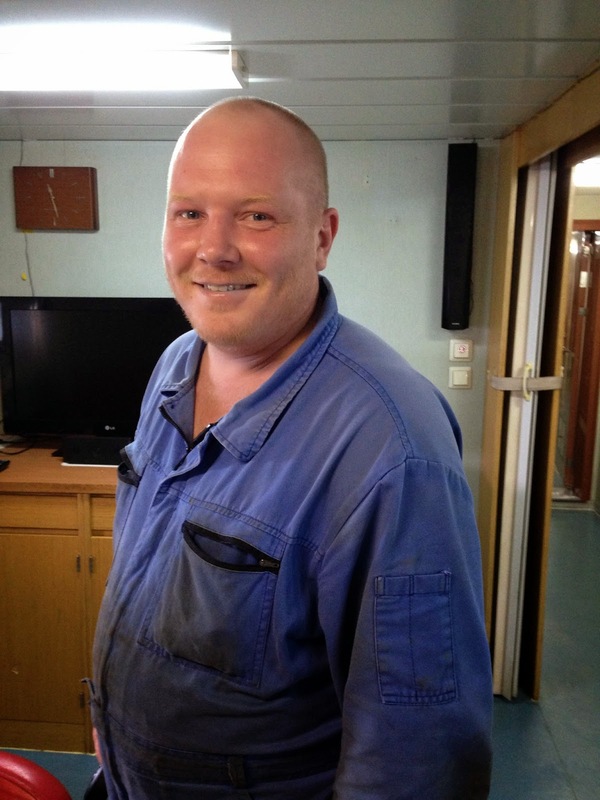 Working with the Mission to Seafarers is amazing because I get to meet people like Vladimir every day. People that remind me that I am not just an American or a Christian, but I am a human being. One of 7 billion on our island home. On a happier note, I've had a great few weeks of ship visiting lately. 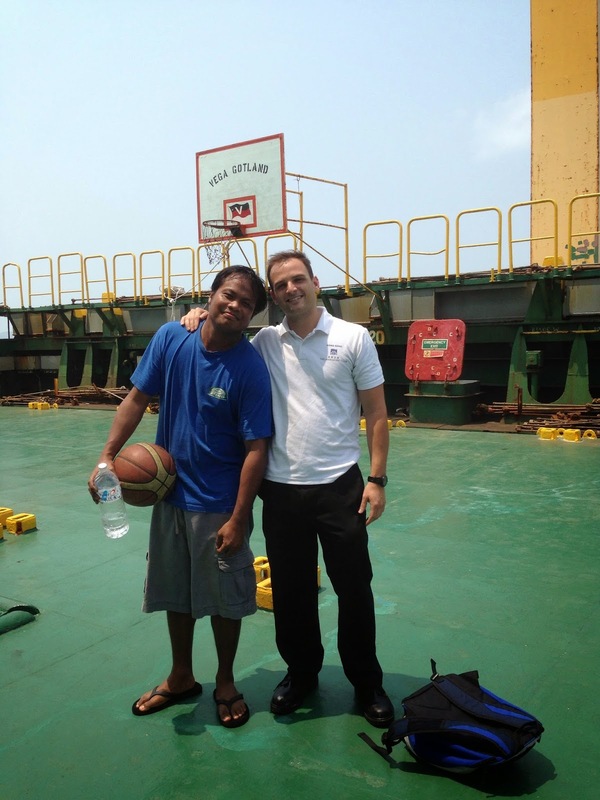 Nearly three weeks ago, I was able to play basketball with a group of seafarers - on their container ship! The ship, the Vega Gotland, had been waiting out in the anchorage for a little over two weeks. 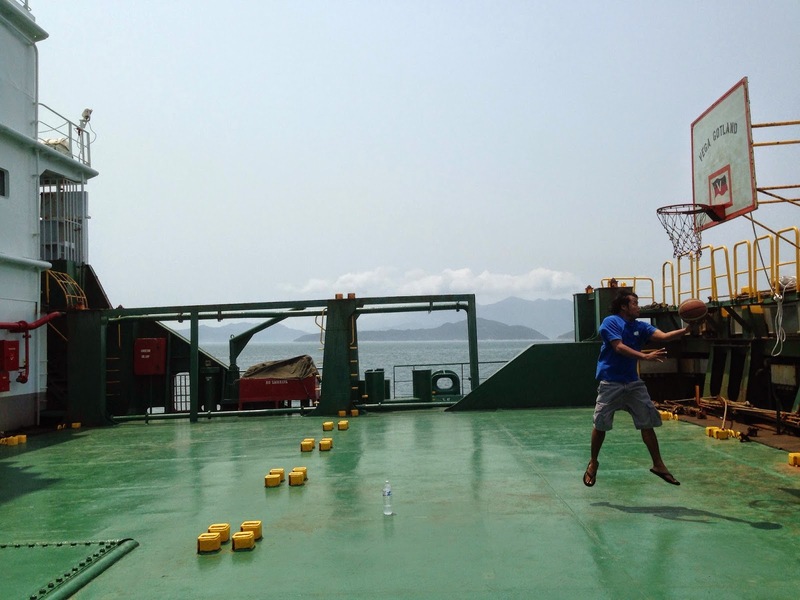 The ship was empty of cargo, so the crew spent their time off duty playing pick up basketball. It was so fun playing and chatting with them. I made some great friends on the ship and I hope I can see them again when they return to Hong Kong.